The need to understand China has never been more pressing. Within one generation, the global giant has transformed from an impoverished, repressive state into an economic and political powerhouse; yet conflicting impressions of the country and its leaders abound. In the fully revised and updated second edition ofChina in the 21st Century: What Everyone Needs to Know, China expert Jeffrey Wasserstrom provides cogent answers to the most urgent questions regarding the superpower, and offers a framework for understanding its meteoric rise. Focusing his answers through the historical legacies--Western and Japanese imperialism, the Mao era, and the massacre near Tiananmen Square--that largely define China's present-day trajectory, Wasserstrom introduces readers to the Chinese Communist Party, the building boom in Shanghai, and the environmental fall-out of rapid Chinese industrialization. He also explains unique aspects of Chinese culture such as the one-child policy, and provides insight into how Chinese view Americans. Wasserstrom reveals that China today shares many traits with other industrialized nations during their periods of development, in particular the United States during its rapid industrialization in the 19th century. He provides guidance on the ways we can expect China to act in the future vis-à-vis the United States, Russia, India, and its East Asian neighbors. The second edition has also been updated to take into account changes China has seen in just the past two years, from the global economic shifts to the recent removal of Chongqing Party Secretary Bo Xilai from power. 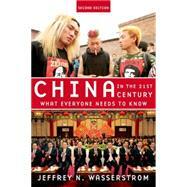 Concise and insightful,China in the 21st Centuryprovides an excellent introduction to this significant global power.